A few years ago while sitting on a bench outside my workplace I noticed two birds running around making all kinds of noise. One was much larger than the other was so I assumed that she was the mother trying to feed her young. I couldn't believe that the small bird, a lovely little sparrow, was jumping up an down trying to put food in the mouth of this ungrateful screeching little big bird who did nothing but keep his mouth open and run around as if he wasn't getting enough to eat. The mother was exhausted from all this jumping about. I thought I'd give the mother a break and throw some breadcrumbs out there for them to share. Do you think the 'Baby' bird would feed itself - NO! It still waited for Mom to jump up and put the morsels in its mouth. If this were the real mother of this monster bird, then I would hate to see the father! I've heard of birds laying their eggs in 'foreign' nests but the least they could do is pick a surrogate mother their own size! Since then I've been reading up on 'brood parasites' - that's what they call these deadbeat mothers who leave it up to other birds to raise their babies. The one most popular in the Americas seems to be the Brown-headed Cowbird which is a pretty big bird in comparison to the sparrow. To help out the sparrow I decided to go into real estate - wild bird real estate that is: birdhouses and feeders, plus baths and fountains. This way the sparrow can move in a small holed birdhouse and not worry about a bigger bird coming in and laying its eggs for her to raise. She can bring up her own little sparrows the way nature intended. 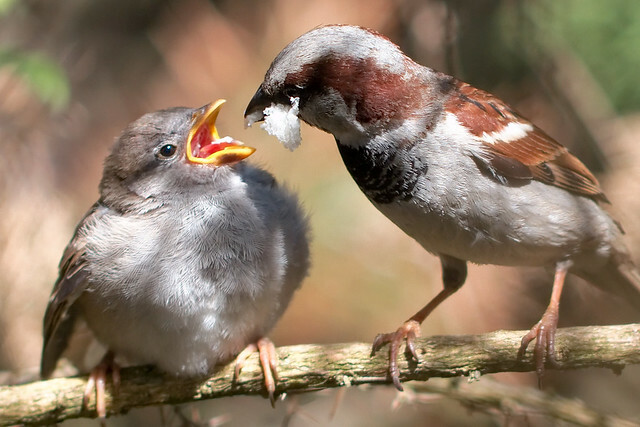 Even the most ardent bird lover can have a love-hate relationship with the House Sparrow. Despite being very sociable birds they are also known for destroying crops and some people see them as pests. House sparrows are native to Europe and Asia but have colonised throughout the world and in the US they are known as English Sparrows to distinguish them from native species. They are now the most widely distributed bird on the planet and in the RSPB's 2008 Big Garden Bird Watch they were the most counted British garden bird. In the 18th century many parishes in Britain had "sparrow clubs" set up to destroy as many sparrows as possible because of their destruction to crops. Bounties continued to be paid until the 19th century when it was realised that the culling was not working. Unfortunately House Sparrows are now struggling to survive along with many other common British birds and have declined in numbers so much that they have been put on the IUCN Red List of threatened species. It is thought that lack of food and suitable nest sites is contributing to the decline. In the 1950s the UK sparrow population was estimated at 9.5 million which increased to 12 million in the 1970s. The numbers started to fall in the 1990s and the population is estimated to stand at about 6 million now. The male sparrow has a grey crown and nape, edged with dark brown on the sides of the head and a distinctive black bib. The larger the male's bib, the better he is at attracting a mate. Upper plumage is a flecked with brown, buffs and greys. House sparrows breed between April and August preferring to nest in colonies of 10 to 20 pairs. They like to nest in holes and under roof tiles or if there is a shortage of holes then they will build a nest in a thick hedge. They lay up to 6 eggs which incubate for about 12 days. Sparrows can raise 3 or 4 broods during one breeding season. The author is a keen gardener and amateur bird watcher.